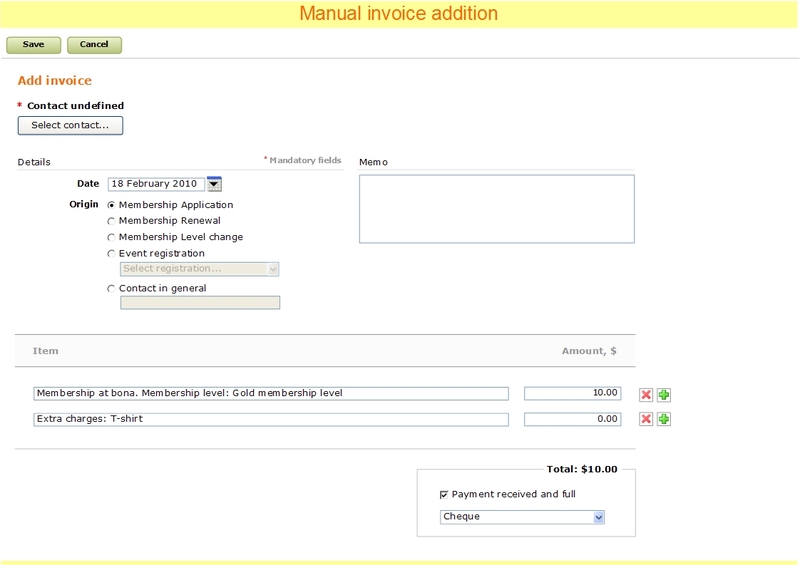 Part of the new Financial management features that we are adding applies to Invoices. These aren't just for your contacts or members information, but are also going to be an essential building block for how each transaction is handled. Right now they're mostly associated with Membership transactions and they are static documents which are generated on-the-fly. The first major change is that an invoice is going to be generated for each Business operation. A business operation is any financial transaction that happens on your site (membership application, renewal, event registration, donation). Any time one of these actions is started, the system will automatically create an invoice. This invoice will be associated with the business operation and also with the contact that performed the action. This of it like an IOU that says that the contact owes you some money. This is added to a total that the contact owes your organization (see last week's post to see how this information is displayed on the contact card). This amount is owed until they complete paying for it: This could be either by them sending you the payment and you recording it in the system, or when their credit card is charged if you are using an online payment gateway. You will also be edit an existing invoice. You can use this if you want to offer an after-the-fact discount as the result of a deal or barter, or if you want to prorate a purchase. You can also edit the description of the items on the actual invoice, for example if you want to put a small note on the invoice. Any changes you make the price will automatically update the transaction and the amount that the contact may owe you. Sometimes you might also have a business operation that is not captured by Wild Apricot - maybe an ad hoc sale or someone has given you money for advertising consideration. 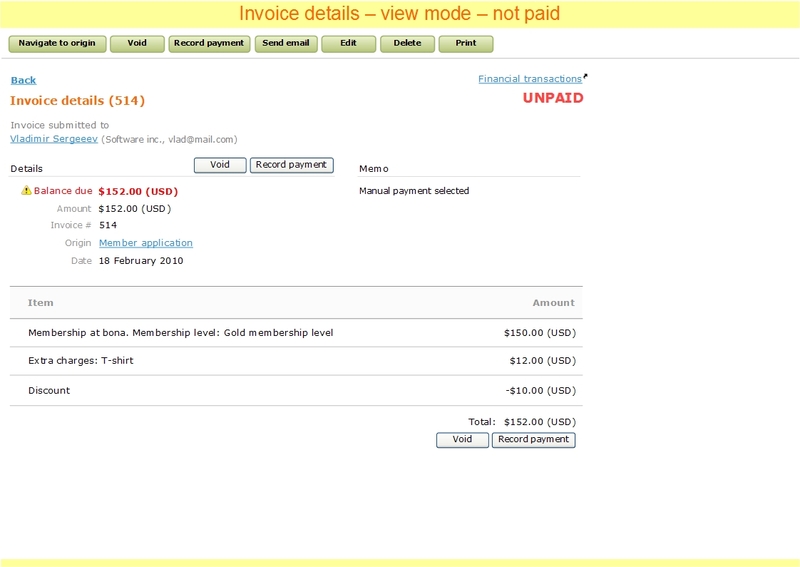 We are designing a system where you'll be able to go in and create a Manual Invoice. You can indicate if it should be associated with a certain business transaction, or you can create an entry for a new type of business operation. And because invoices are so integrated, this transaction and any amount owing is associated with the contact. This way you don't have to worry about keeping a separate record for transactions outside of Wild Apricot. Here are a few of the mock-up screens we have for invoices. The look and feel of them will probably change a little as we do our testing, but they should give you an idea of some of the new features you'll have. Normally at this point I'd talk about a few threads you should check out on our forums. This week I'm going to be a little different. Dmitry, our Chief Apricot, has been going over the Wishlist forums. I'll be reviewing his notes and comments and updating the information our analysis team uses to design new features. I'd advise everyone to take a little time and just look through the Wishlist and the suggestions being made there. A lot of the older threads will be moving up the top of the list, meaning that you might see that the little feature that you thought would only interest you has actually been sitting there, patiently waiting for your input. That's what's going on behind the scenes at Wild Apricot this week. See you in seven days.